Pan-Crisped Salmon with Light Dijon Cream and Garlic Butter Breadcrumbs. Because chances are, you ate a billion fun sized candy bars for dinner last night and need a… real meal. I mean, maybe you didn’t, but we sort of have this mutual relationship of sorts and kind of, I don’t know, get each other? I just have a feeling. It’s like ESP for sugar. Maybe you didn’t eat a bunch of candy but instead chewed on an entire tiny box of orange tic tacs for dinner. I haven’t done that in a loooong time but was super tempted when I saw some in the check-out line yesterday which reminded me of how I’d beg my mom to buy them then I’d literally pop ’em like candy. Like I’d actually take down an entire container of those in one day when I was younger. It’s not like anyone believes that those little orange gems are breath fresheners anyway. It seems like ages since I’ve shared a recipe for my favorite fish, but that’s simply because there are many that I love oh so much. I make one of them on a weekly basis which is saying a lot since I get bored, like, five minutes before something even happens. Next week I hit 30 so maybe I’ll grow out of that? Huh. One can dream. So, two weeks ago my dad ordered a salmon dish for lunch that was covered in some sort of cream sauce and a light sprinkling breadcrumbs, and it just looked fabulous. In true Jessica-fashion I could not stop thinking about it. Sidebar: you really don’t ever want to do anything in Jessica-fashion. But you probably already know that. Instead of broiling my salmon like I often do, I seared it for a few minutes which left it crispy on top but buttery inside. In the same skillet, I used some low-fat evaporated milk and a bunch of other delicious things to whip up a super fast and light cream sauce which was, um… amazing. I have a serious mustard addiction. Well, I have an addiction to all things tart, briney and somewhat bitter (vinegar, pickles, olives… get in my face), but mustard is the most severe by far. I actually have a mustard COLLECTION. And now you know more than you ever wanted. Prepare breadcrumbs first by heat a small saucepan over medium-low heat and adding 1 tablespoon of butter. Add in 2 minced garlic cloves and cook for 30 seconds until fragrant, then stir in bread crumbs well, tossing for a minute or two until the mixture is combined and slightly golden. Set aside. Heat a large skillet over medium-high heat and add olive oil. 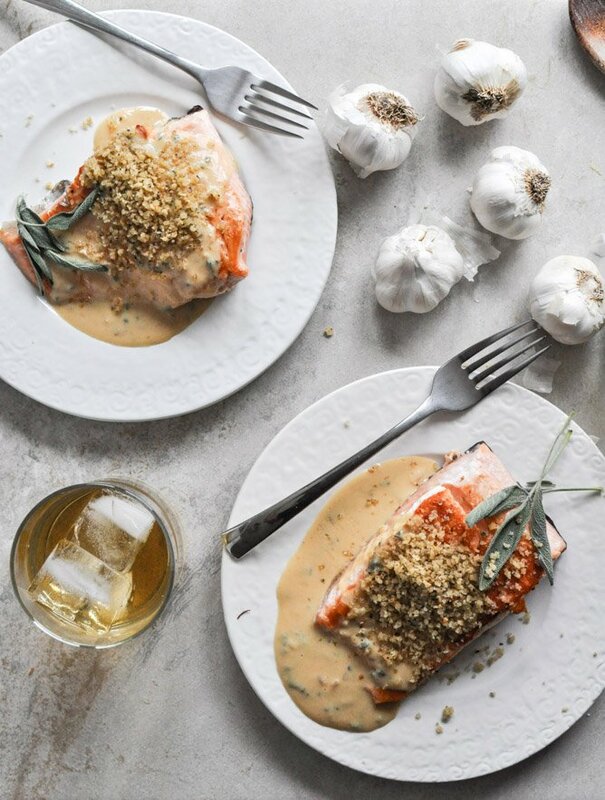 Season salmon with salt and pepper, then place in the skillet (skin side up, if the salmon has skin) and cook until opague in the center and golden on each side, about 5-6 minutes for salmon that is 1-inch thick. 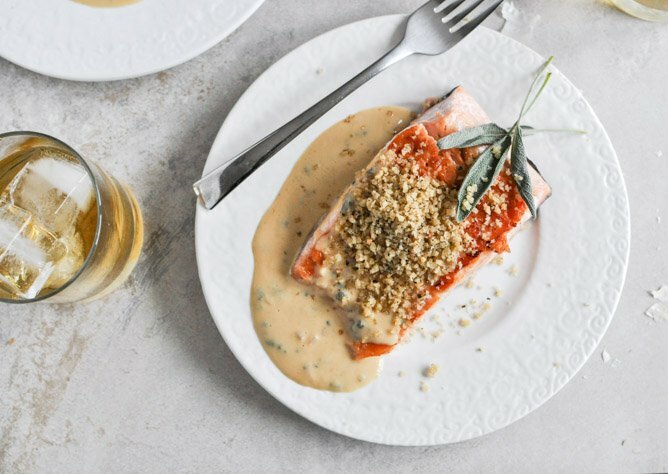 If you use salmon with skin, simply cook it skin side up the entire time. Remove salmon and set aside, then add remaining 1/2 tablespoon of butter, shallot, garlic, and sage. Stir well to coat then cook for 1-2 minutes until sizzling, then add in white. Cook for 2-3 minutes, allowing it to bubble and slightly reduce, then whisk in milk and mustard. Continue to whisk and cook while milk bubbles on the sides and thickens, stirring for a minute or two. Taste and season additionally or whisk in a bit more dijon if desired. 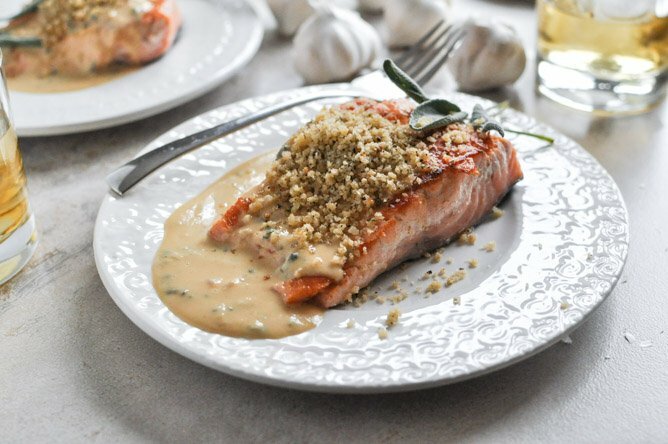 Serve salmon immediately, drizzled with dijon cream and then top with breadcrumbs. Serve with rice, potatoes, vegetables or salad! 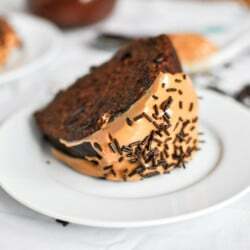 Chocolate Fudge Peanut Butter Cake. Thank you so much for this recipe! It was AMAZING! By far the best salmon I’ve ever eaten. And that includes dishes I have had at restaurants. It was beautiful on the plate and tasted even better than it looked. So flavorful, balanced and delicious. And it was easy to make! I can’t rave about it enough. I will be making this again and again. It will be great to make when company comes over b/c it is such a stunning presentation. Thanks again! Just tried it tonight. My girlfriend said it was her favorite version of Salmon that she has ever had. The panko was very crispy and with the garlic flavor added a very special taste. The cream sauce with its bitterish taste from the dijon and sage tied all the savors in together. Pingback: meals / week 1 » hk in love. I’m so glad I found this recipe! I’ve been craving salmon but also realized I have sage leftover from last week that needs to be used up. Magically this combines both. Will be trying it out tonight! Had some salmon yesterday and I was looking for a new recipe. Oh my are we glad we found this one!!! It was so good and easy to prepare! As others have commented it would make a perfect entree for guests! It was not just delicious, but pretty too! We didn’t have panko so I used regular breadcrumbs, would cut back to 1/2 the amount if using regular again. We will make this again for sure! Thank you for such a fantastic recipe!! Delicious! Kids loved it too. I just made this and it was INSANE. It sounds great, but it tastes BONKERS. If you’re considering this recipe, MAKE IT RIGHT NOW. I am late to the game, finally making this. but glad that I was late rather than never… the others’ comments are absolutely correct – this is fantastic! Thank you for creating and sharing it with the world!